18.2 million people living in the United States have diabetes. This number represents over 6.3% of the population. One of the most common complications of diabetes is loss of sensation in the feet. 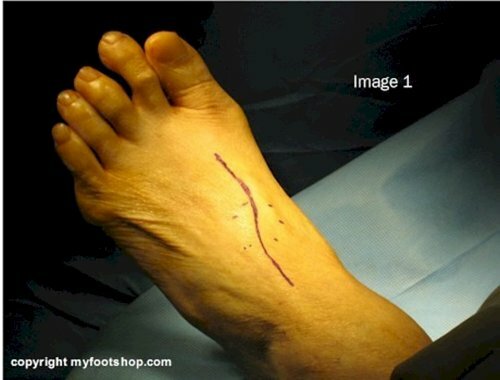 This loss of protective sensation (LOPS) is called diabetic peripheral neuropathy. Diabetic peripheral neuropathy is a complication that can be expected in 60-70% of all cases of diabetes mellitus. Diabetic peripheral neuropathy is the most significant contributing factor to loss of limb in diabetic patients. The symptoms of diabetic peripheral neuropathy are progressive and often directly proportional to how well blood sugars have been regulated since the onset of diabetes. Initial symptoms of diabetic peripheral neuropathy include loss of sensation and sharp, shooting pains in advanced cases. 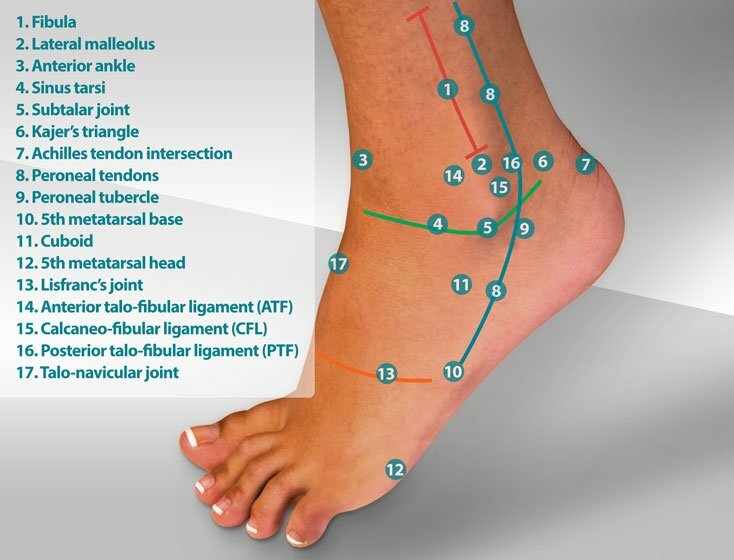 Diabetics with advanced peripheral neuropathy experience a loss of proprioception, or the ability to determine where you are in relationship to the ground or space. As a result, diabetics with peripheral neuropathy become unsteady on their feet due to advanced loss of sensory and motor function. Falls are common, which can result in additional morbidity including broken hips. Diabetics with advanced peripheral neuropathy also experience loss of motor control of the muscles that control the function of the feet. It's important to remember that the task performed by peripheral nerves is to mediate both sensory information and to coordinate muscle function. Loss of muscle function also contributes to an increased tendency toward falls. Poorly-controlled diabetes mellitus results in long-term exposure of the peripheral nerve to elevated blood sugar levels and the resulting metabolites of poor sugar regulation. Many theories have been proposed to detail how long-standing diabetes mellitus affects the peripheral nerves. The most accepted theory proposed to date relates to elevated levels of sorbitol in circulating blood. Sorbital is a by-product of the metabolism of glucose. Impaired metabolism of glucose results in elevated levels of sorbital, which is known to be toxic to the peripheral nerves. As a general rule, peripheral neuropathy is known to be caused by long-term exposure to caustic chemicals. Long-term exposure to sorbital is an established mechanism to describe the onset of diabetic peripheral neuropathy. Another factor that contributes to the onset of diabetic peripheral neuropathy is decreased arterial circulation of the peripheral nerves. Elevated blood glucose levels affect arteries and arterioles in a number of ways. Increased levels of blood glucose make the blood viscous. The circulatory system has a difficult time pushing a viscous fluid through the artery. As a result, the walls of the arteries and arterioles become hard and less permeable to blood. Peripheral nerves are significantly affected by this microvascular change. In the presence of high circulating levels of blood glucose, peripheral nerves are essentially starved of oxygen and essential nutrients and vitamins. Diabetic peripheral neuropathy is a result of sustained high blood sugars (hyperglycemia.) Contributing factors include obesity, hypertension, high cholesterol levels, and smoking. The diagnosis of diabetic peripheral neuropathy is often made based upon a history and physical exam. In early stages of diabetic peripheral neuropathy, patients are often unaware of why their feet feel numb, and since there is no pain, many diabetic patients fail to seek care. A history and physical exam of a diabetic patient should include vibratory testing, sharp/dull discrimination and testing of light touch of the feet. 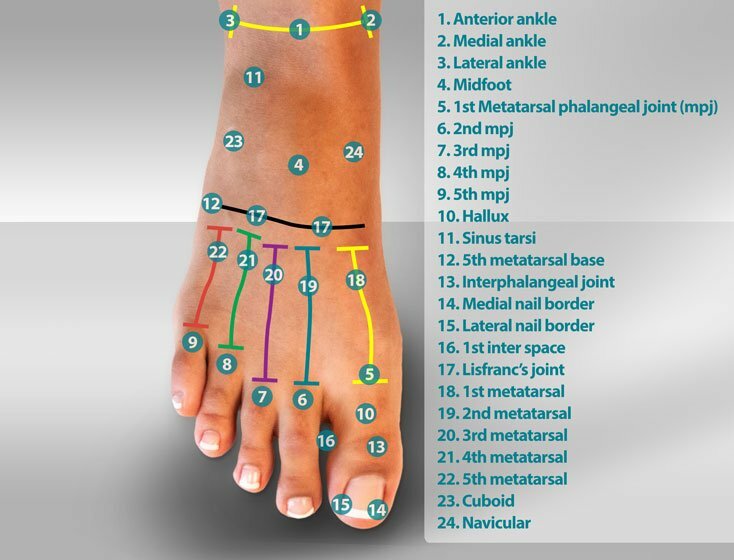 Each of these tests help to define the location and extent of diabetic peripheral neuropathy. Nerve conduction studies and electromyography are used to test the response time of nerve and muscle. Delays in response time and the pattern or distribution of sensory/motor loss helps to define diabetic peripheral neuropathy. Epidermal (skin) nerve biopsies are another test used to diagnose diabetic peripheral neuropathy. The total number of epidermal nerves decreases with diabetic peripheral neuropathy. The skin biopsy serves as a means by which nerve fibers can be counted. A decrease in nerve fiber counts suggests advancing diabetic peripheral neuropathy. An increase in small nerve fibers suggests a response to treatment. Epidermal nerve biopsies are currently the most sensitive testing method that is used to screen for diabetic peripheral neuropathy. Pyridoxine (B6) has been used for years as a method of nutritional support following peripheral nerve damage. Vitamin B6 is water soluble and can therefore be eliminated by your body. Common doses range as high as 250mg/day. Exciting new treatment modalities for diabetic peripheral neuropathy include the used of anti-oxidants. 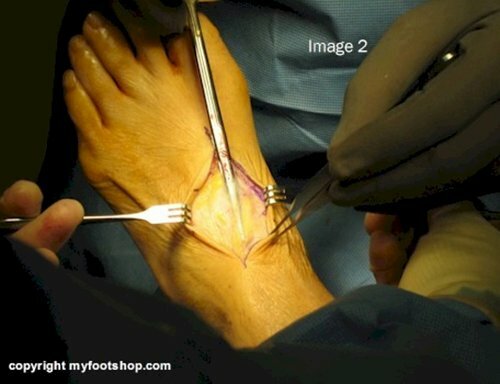 These scavengers of the body are used to eliminate toxins which may contribute to peripheral neuropathy. Anti-oxidants used to treat peripheral neuropathy include gamma-linoleic acid and alpha lipoic acid (thiotic acid.) Alpha lipoic acid increases glucose uptake in muscle and fat cells to improve both the symptoms of diabetic peripheral neuropathy and diabetes. It has also been suggested the alpha lipoic acid may help treat insulin resistance. A study by Tankova et al. showed up to a 65% reduction in the symptoms of DPN with high doses of alpha lipoic acid. Other treatment may include the use of metabolic factors or medications such as aldose reductase inhibitors or aminogunidine. Autoimmune therapies and nerve growth factors have also been tried. Oral dextromethorphan, a N-methyl-D-aspartate (NMDA) receptor antagonist has also been used for chronic peripheral neuritis. Dextromethorphan is widely available over the counter in non-narcotic cough preparations such as RobitussinDM and Benylin DM. It is believed that dextromethorphan has the chemical ability to relieve peripheral neuritis pain by blocking pain sensation. Studies have shown as much as a 24% reduction in peripheral neuritis pain as compared to a placebo. Typical dosing for these tests were 120mg/day or 3 tsp every six hours with some ranging up to 3 tbsp every six hours. Mentanx is a prescription medical food supplement that is used for dietary management of endothelia dysfunction in patients with diabetic peripheral neuropathy. Mentanx increases nitric oxide synthesis and offers the potential advantage of improving blood flow to peripheral nerves. The literature shows an increase of 136% blood flow to the peripheral nerves with the use of Mentanx over 8 weeks. Mentanx is FDA approved for diabetic peripheral neuropathy. The success of each of the modalities mentioned above can be monitored with the use of periodic epidermal small nerve biopsies. The epidermal small nerve biopsies can be performed in a matter of minutes in your doctor's office using just a local anesthetic. Advanced diabetic peripheral neuropathy symptoms often produce severe pain. These symptoms are described as electrical sharp-shooting pains, burning pain, and tingling pain. For many patients, these symptoms are tolerable during the day but become severe at night, often limiting the normal sleep cycle. Neurontin (gabapentin) is a medication frequently used to suppress the symptoms of diabetic peripheral neuropathy. Neurontin can be taken in divided doses during the day or in a single dose at bedtime. It is best to titrate Neurontin based upon the degree of symptoms. Normal daily doses range from 300mg to 3200mg. 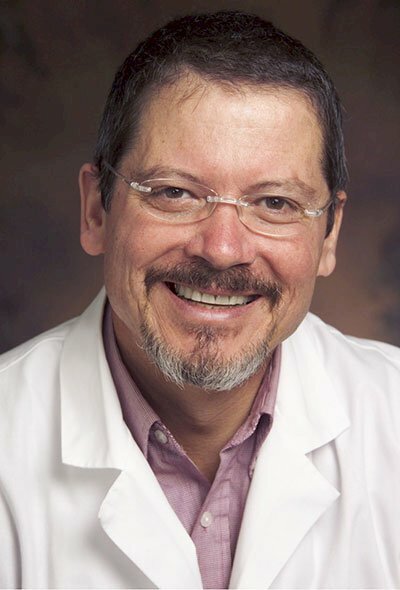 Although the use of Neurontin for the control of symptoms due to diabetic peripheral neuropathy is considered an "off-label" use by The Food And Drug Administration, doctors use it regularly for control of peripheral neuropathy symptoms. Cymbalta (duloxetine hydrocholride) was introduced by Eli Lilly Co. Cymbalta is a selective serotonin and norepinephrine reuptake inhibitor (SSNRI) used for the treatment of pain and depression associated with diabetic peripheral neuropathy. Cymbalta is FDA approved for control of the symptoms of diabetic peripheral neuropathy. Cymbalta has been found in studies to be safe and effective. Dosage for Cymbalta is usually between 60-120 mg daily. Lyrica (pregabalin) is a new generation of gabapentin introduced by Pfizer in 2004. Lyrica is also approved by The FDA for the treatment of symptoms secondary to diabetic peripheral neuropathy. The exact mechanism of action is not fully understood, but the presumed action is that pregabalin binds with the alpha2-delta subunit of protein of calcium channels and acts to reduce the release of excitatory neurotransmitters. Lyrica also has been shown in clinical testing to be safe and effective. Other medications for advanced diabetic peripheral neuropathy include antidepressants such as Elavil. One of the side effects of Elavil and its related family of medications is drowsiness. This side effect can be helpful in restoring the normal sleep cycle in patients who suffer from painful peripheral neuropathy symptoms. 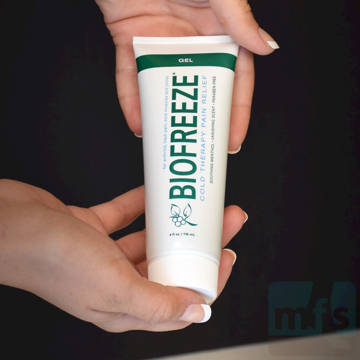 Topical medications that can be used to sooth the pain of peripheral neuropathy include Biofreeze and Neuragen PN. 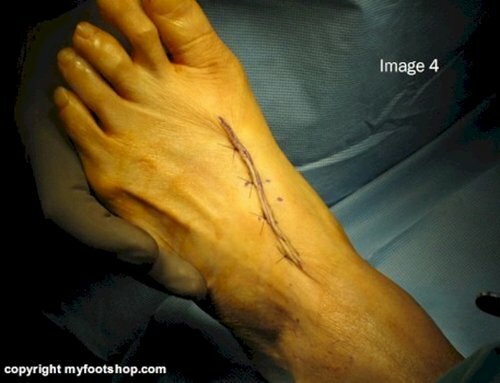 Surgical decompression of peripheral nerves may be used to treat diabetic peripheral neuropathy. 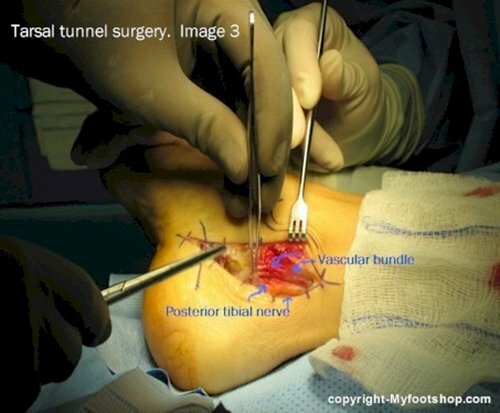 This surgical technique is called external neurolysis. One school of thought believes that elevated levels of glucose tend to draw water into the nerve. As the sugar content within the nerve increases, water is drawn in as an osmotic gradient. Increased intra-neural pressure that results from this osmotic gradient places pressure on the nerve, resulting in diabetic peripheral neuropathy. This internal pressure is called crush syndrome. External neurolysis relieves this pressure, restoring normal function to the nerve. 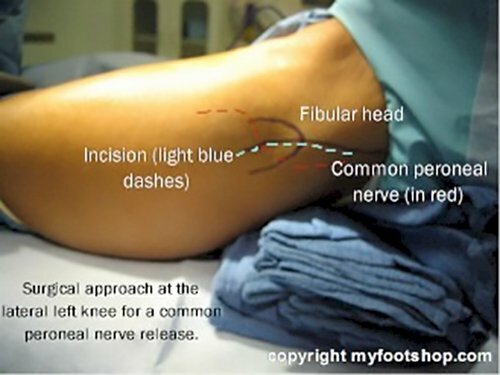 The following images show what is called a triple crush release (3 separate compressed nerves.) The first row of images show external neurolysis of the deep peroneal nerve. 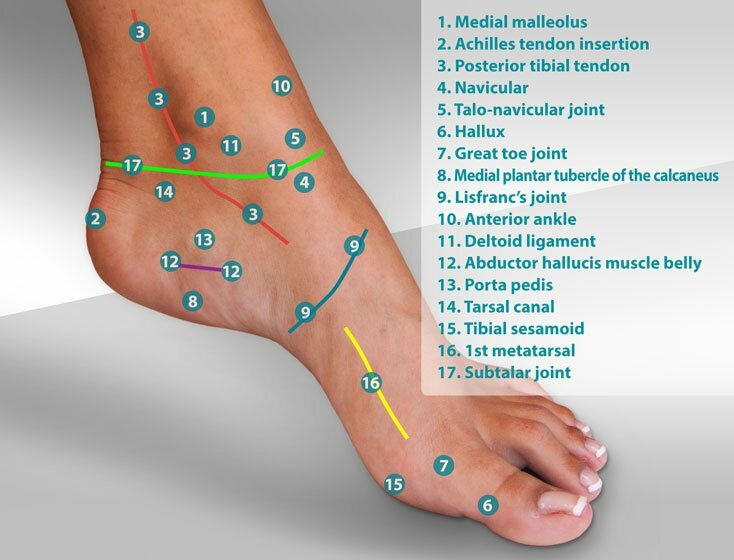 The second row shows surgical external neurolysis of the posterior tibial nerve. The third row shows external neurolysis of the common peroneal nerve, lateral aspect of the knee. Diabetic peripheral neuropathy is progressive and should always be evaluated by your podiatrist or primary care doctor. Early intervention and treatment are important. Diabetic Peripheral Neuropathy by Myfootshop.com is licensed under a Creative Commons Attribution-NonCommercial 3.0 Unported License. Semmes-Weinstein Monofilament Testing Devices are used to screen for diabetic peripheral neuropathy. Semmes-Weinstein Monofilament Testing Devices are an industry standard for testing sensory loss in diabetic patients. One/package. Natural Antifungal Lavender Tea Tree Foaming Soap is made with all-natural oils. It's a simple and effective way to treat fungus and bacterial infections while leaving your skin soft, clean, and hydrated. Pump dispenser. By Myfootshop.com. 7oz. bottle. Natural Lavender Tea Tree Lotion - 8 oz. Natural Lavender Tea Tree Lotion soothes dry skin and treats common fungal skin infections. Our therapeutic formula of tea tree oil and lavender oil absorbs quickly, leaving feet and hands naturally soft and smooth. By Myfootshop.com. 8-oz. 1/pkg. 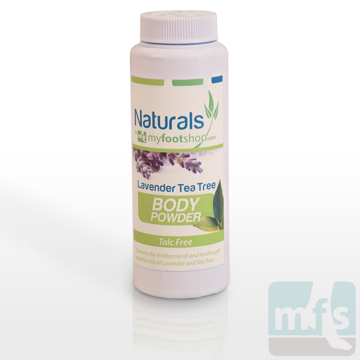 Natural Lavender Tea Tree Body Powder is a talc-free, antifungal product designed to keep skin dry and odor-free. 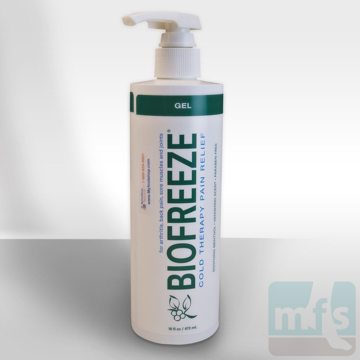 Made with all-natural ingredients that prevent skin infections including athlete’s foot, jock itch, and diaper rash. By Myfootshop.com. 2 oz. bottle.